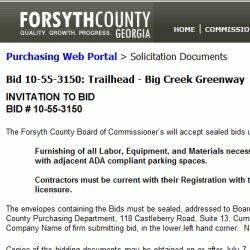 Forsyth County has opened up bidding for contractors on building restrooms and ADA (Americans with Disabilities Act) compliant parking spaces at the Forsyth County Big Creek Greenway Trailheads. It is not clear from the bidding site which parking lots will include these amenities, but most likely the McFarland and Bethelview Parkway parking lots will be included with this. There are not currently any dates listed on when the project would start or be completed. We will keep you up to date when we find out more details. Thank goodness! If you ask me though, it should have been done ages ago!